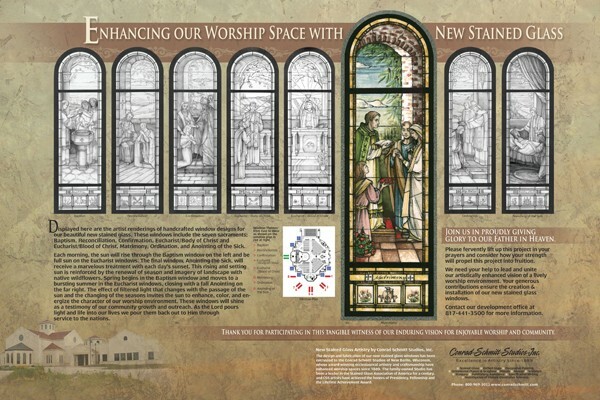 For Holy Redeemer Catholic Church in Aledo, Texas, the challenge was to create new stained windows celebrating the seven Catholic Sacraments of Baptism, Reconciliation, Marriage, Eucharist, Confirmation, Ordination and the Anointing of the Sick. 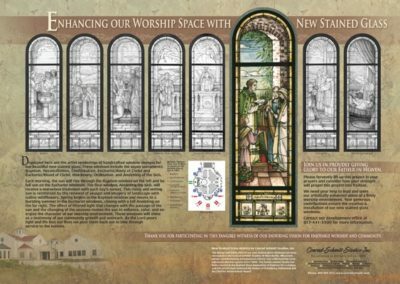 A critical part of this design challenge hinged on designing eight windows to celebrate the seven sacraments. 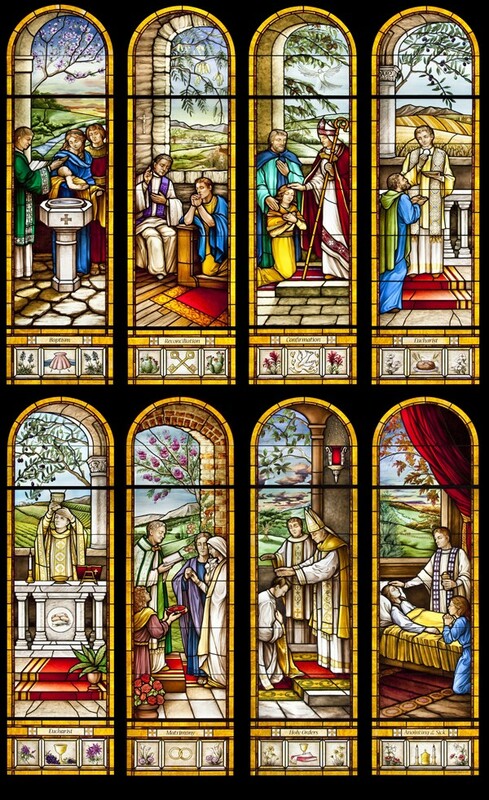 This was accomplished by having two central windows represent the Body and Blood of Christ for the Sacrament of the Eucharist. 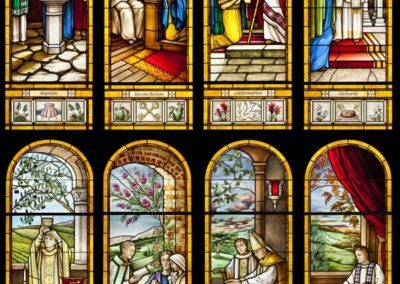 All of the windows were created in a traditional style with realism in the figures and opalescent glass for the borders. The simple elegance of the compositions made the windows work well in a modern space while still echoing the traditional feel desired by the congregation. Themes including sunrise and sunset are important design elements. Each morning, the sun rises through the Baptism window on the left and radiates full sun on the central Eucharist windows. The final window, the Anointing the Sick, receives a marvelous treatment with each day’s sunset. This rising and setting sun is reinforced by the renewal of season and imagery of landscape with native wildflowers. Spring begins in the Baptism window and moves to a bursting summer in the Eucharist windows, closing with fall in the Anointing window on the far right. The effect of filtered light that changes with the passage of the sun and the changing of the seasons invites the sun to enhance, color, and energize the character of the worship environment.